If you don’t know about SCOTTEVEST, you should. In 2000, Scott Jordan developed a multi-pocketed vest specifically for tech folks who tend to carry all kinds of gear. There are individual pockets for phones, a camera, memory cards, spare batteries, cables, wallet, passport, and many more. Here’s Scott Jordan wearing his newest offering, the SeV Pack Jacket. 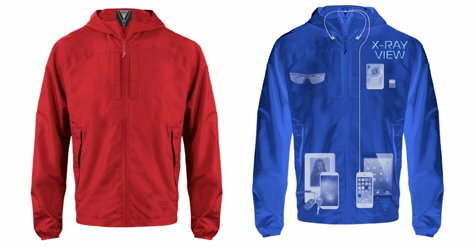 The SeV Pack Jacket is constructed from a luxuriously soft 100% poly that is very light weight and breathable. It’s perfect for times when the sun goes down or the wind comes up. 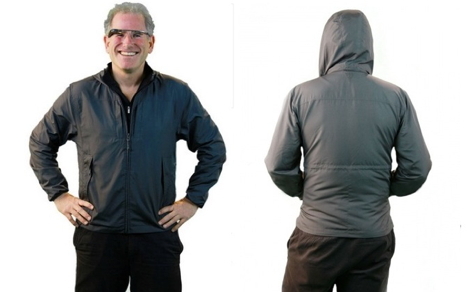 The jacket is hooded and offers water-resistant protection for damp days. If you’re good at Origami, the jacket can be folded flat and stored in one of its own pockets. I discovered that it can be rolled into a cylinder that fits conveniently in the water bottle compartment of my day pack. The pockets of the SeV Pack Jacket are where the design skill and cleverness comes in. There is a pocket designed to hold and protect your iPad mini or Kindle, and another to hold your iPhone. This pocket is fleecy so its fabric can be used as a screen cleaner. There are two zippered side pockets for hand-warming, and one contains a springy key lanyard. The two zippered chest pockets are for smaller items and each has a secret buttonhole so your earphone cable can pass through. This is part of the patented Personal Area Network (PAN). On the left side, about neck height, a small elasticized loop permits you to continue channeling the earphone cable up to your ears. This makes listening to music or using your phone very tidy. No loose, tangly wires. In total, the Pack Jacket has thirteen pockets (yes, thirteen!) and yet weighs in at a mere 9.7 ounces (275g). That’s less than the weight of an iPad mini. The construction is carefully engineered around SCOTTEVEST’s Weight Management System. An iPad or Kindle’s weight can be balanced by a camera or other items in pockets on the other side. Having pockets arranged around the left and right sides distributes weight so you can carry an amazing amount of gear and be very comfortable doing so. The SeV Pack Jacket is fitted and outfitted; it is comfortable and comforting. The company makes several jackets that are heavier and warmer, but this one is fast becoming my go-to jacket because of its good looks, light weight, and convenience. MyMac Review rating is 9 out 0f 10.